If it wasn’t for some perseverance and a bit of luck in the form of Cleveland Public Theatre (CPT) founder James Levin deciding to a chance on an unknown Case Western University dance department graduate and giving her the opportunity to mount her first show, the 1997’s groundbreaking LEAPING INTO THE NET!, dancer/choreographer Sarah Morrison might not have stayed in Cleveland. Brought here in 1992 by a CWRU Creative Achievement Award Scholarship for her choreography, Morrison, an Atlanta-native, might have returned to Georgia without ever forming MorrisonDance, a mainstay on the Northeast, Ohio dance scene. 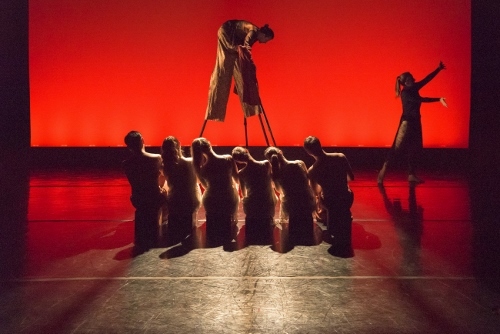 Now celebrating its 20th Anniversary season, MorrisonDance returns to CPT this weekend, May 24-26, for a retrospective showcase of Morrison’s staged dance works as part of Cleveland Public Theatre’s DanceWorks 2018. In addition to performing extensively in the greater Cleveland area including site-specific and aerial works at museums, parks and other venues like Schoepfle Gardens and Edgewater Park, Morrison and her company have had tours to Pennsylvania, California, Georgia, Italy, England, Mexico and New York’s City Center, the Joyce SoHo and Joe’s Pub at Public Theatre. A 2018 recipient of the OhioDance award for “Furthering the Artform of Dance” and a 2009 Ohio Arts Council Individual Excellence Award, Morrison has created over 75 works for her company in the past two decades as its principal choreographer. Sixteen of those works will be highlighted on this weekend’s 20th anniversary program along with “Simean Suit Sequence” (2016), choreographed by longtime MorrisonDance company dancer Taliesin Haugh. Morrison is best known for her highly visual works described as “zany” and “endearing” by former Plain Dealer dance critic Donald Rosenberg, that often involve a light-hearted, playful and humorous approach such as 2001’s “A Tribute to Sissy Hankshaw,” which features a solo dancer wearing oversized thumbs, and the lamp-shade-wearing improvisational solo “My Grandmother’s Lamp” (2003 / 2008). 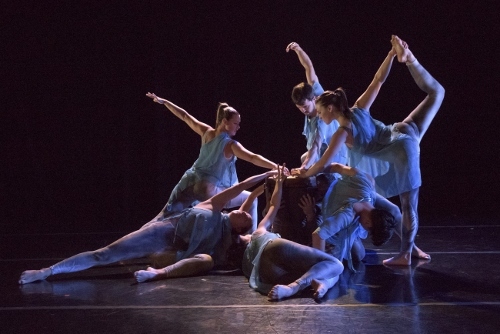 Through those works and many others, Morrison and company have carved out a unique niche in the region as a dance company that embraces quirkiness while regularly delivering an abundance of audience smiles. The 20th anniversary production will showcase that full theatrical spectrum work in a series of short 3-10 minute works and excerpts from larger works that spans the company’s history. Eight performers including Morrison and Cleveland-based performer/composer Braden Pontoli make up the cast for the 2-hour program that includes 2015’s neurotic “Phobophobia,” set to original music by composer Jeremy Allen and voiceover by Clyde Simon and featuring the dancers in inflatable bouncy ball costumes; Morrison’s zebra-striped pant solo “Zugzwang Zebra” (2015) which cleverly uses a white plastic chair with a hole in its back; the seductive and sinister Irish fairytale “Leanan Sidhe,” (an excerpt from the 2006’s Mad Mask Maker of Maigh Eo); the gravity-inspired “9.8 m/s^2”(2007 / 2009), set to music by James Brown; 2010’s “Conflict Resolution,” a duet where the dancers are connected together at their arms and “Out On the Town” (1996), one of Morrison’s oldest works to music by Tom Waits that celebrates Cleveland’s working-class persona in which the female cast is costumed a la the iconic World War II-era “Rosie the Riveter” posters. Morrison says beyond trying to find computer keyboards from the 1990s to use as props, the toughest part about putting together this weekend’s 20th anniversary program was selecting the works that would be included on it. More a retrospective than a greatest hits production, for those unfamiliar with the company and Morrison’s work, it’s a relative crash course in it. And for those already familiar with both, it’s a chance to revisit and reminisce on one of the region’s most long-lasting and unique dance troupes. MorrisonDance performs as part of Cleveland Public Theatre’s DanceWorks 2018, 7:30 p.m., Thursday, May 24 - Saturday, May 26 at CPT’s Gordon Square Theatre, 6415 Detroit Ave., Cleveland. Tickets are $12/Thursdays and $30/Fridays & Saturdays. For more information and tickets call (216) 631-2727 x 501 or visit cptonline.org.